Apologies for 'Yet Another Chorizo Recipe' but the trouble with cooking for one is that you buy a something and then you have to cook with it day after day after day. 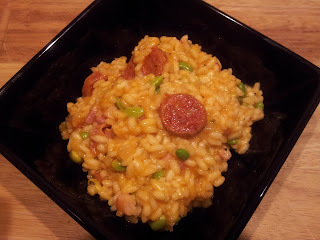 Thankfully I'm still in love with the Unearthed Mini Cooking Chorizos and tonight's recipe is well worth the effort. After cooking for the child, and then the husband, I wasn't sure if I could be bothered to labour over a risotto, but the mindless stirring gave me ample opportunity to catch up with an old friend for twenty minutes - and at the end, I had a really gorgeous tea, all to myself. It definitely needs a glass of crisp, dry white wine to accompany it. And I would definitely recommend watching how strong the stock is as it was quite salty - in fact the nutritional information on the recipe (which I checked AFTER I'd made it) says there's a whopping 5.06g of salt per serving! BBC Good Food, that is shocking. Even though it was ever-so tasty. The recipe is from this month's magazine and hasn't been published online yet. Heat the oil in a medium pan, then add the bacon, shallots, garlic and chorizo. Cook gently for 8 mins, stirring occasionally so everything cooks evenly. Stir in the rice, coating all over with the cooking juices in the pan. Add enough stock to cover the rice, bring to a simmer and gently cook until all the liquid is absorbed. Continue adding the stock a ladleful at a time, and gently cook. Just before the final ladleful of stock, add the broad beans and stir through, cooking for 304 minutes until tender. Remove the chorizo, slice thinly, return to the pan and mix through before serving.